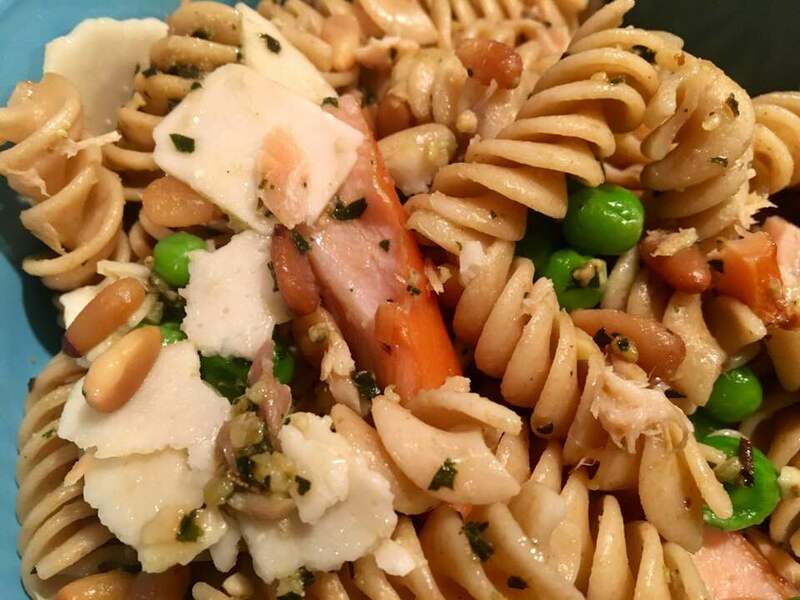 My favorite quick seafood: Smoked salmon, pasta, pesto, peas, pine nuts and Parmesan. Several years ago a friend and I agreed that we almost always order fish in nice restaurants but are just as likely not to cook it at home. We’re both good cooks who cook a lot. Why isn’t this the easiest thing in the world? I can whip up a quick tuna salad (you should try it with the carrots pickled by our daughter’s Russian farmer friend), but anything fancier and I feel as though I’m being asking to catch, fillet and then pan fry trout or something equally intimidating. A friend spending the weekend brought some wonderfully fresh scallops from a Baltimore market. Ugh, I thought, that’s going to take forever to fix. It took seconds to saute them, and they were a total treat. Well, I’m going to get over this fear of fish in 2019. I’m going to grill thick salmon steaks on cedar planks (I have the planks — just need the courage to try it). We’re going to grill a couple of tuna steaks and enjoy salad Nicoise with green beans, hard-boiled eggs, new potatoes and capers. We’re going to enjoy, and you can easily do the same. And make sure you’re eating fish responsibly by checking the National Resource Defense Council’s Smart Seafood Buying Guide . Smoked salmon, pasta, pesto, peas, pine nuts and Parmesan. 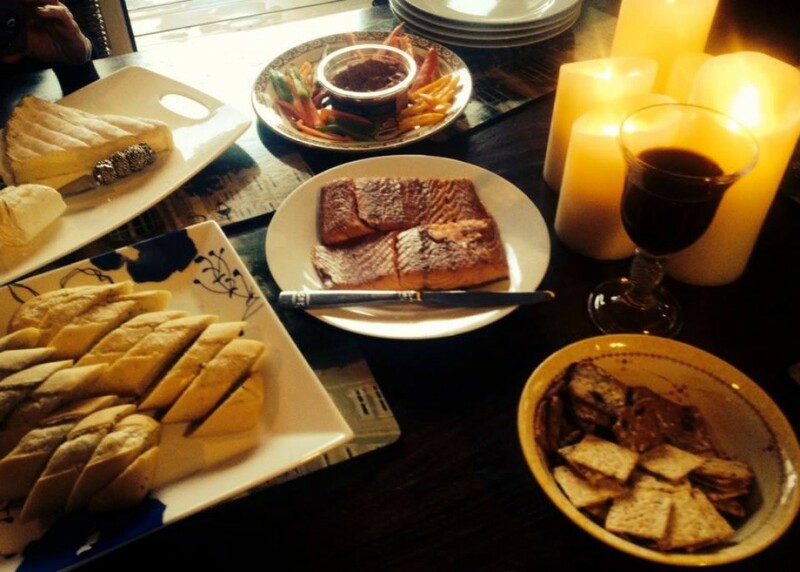 My go-to salmon recipe is so simple and you can measure almost everything by the handful. I cook 2 ounces dry pasta (preferably whole grain) for every serving. For the two of us, then, 8 ounces of pasta is enough for two suppers. I also use about 8 ounces smoked salmon for 4 servings. Cook the pasta, according to package directions. When it’s done and drained, start adding everything else. You’ve shredded the salmon, you’ve toasted a 2-ounce package of pine nuts, you’ve thawed two “ice cubes” of last summer’s pesto, you’ve tossed in a couple handfuls (I was not kidding about the handfuls) of frozen peas. They’ll thaw as quickly as you stir everything together. Add salt and pepper to taste, top with another handful of grated Parmesan. (Aldi’s has 4.4-ounce bags of shaved Parmigiano Reggiano that taste much more expensive than they are.) That’s all there is to it — add a green salad and maybe something whole wheat if you eat bread and pasta in the same meal. This is another wing-it entree without a list of ingredients. You’ll want 4 ounces of a white fish for each serving. Start by caramelizing a chopped onion in a spot of olive oil in a large skillet. If you like mushrooms as much as we do, add the contents of an 8-ounce box, brushed clean and sliced, to the skillet when the onions are about halfway to a nice, rich brown. You could add a couple cloves of peeled, slice garlic if you like. When the mushrooms give off their liquid, add halved cherry tomatoes and continue heating the vegetables. You probably don’t have much liquid now so add a good solid splash of a good white wine (1/2 cup maybe?) and scrape up the browned bits from the bottom of the skillet. Now lay the fish fillets across the vegetables. Season liberally with salt and pepper and herbs de Provence (tarragon would be a good alternative or Italian seasoning). Put the lid on the skillet and dial the heat back. It should take no more than 5 minutes for the fillets to become opaque which means they’re done. Serve this fish dish over rice, pre-cooked or some you’ve slaved over yourself. Sprinkle before serving with blue or feta cheese crumbles. See? Easy-breezy, lemon-squeezy fish dishes. It is possible! 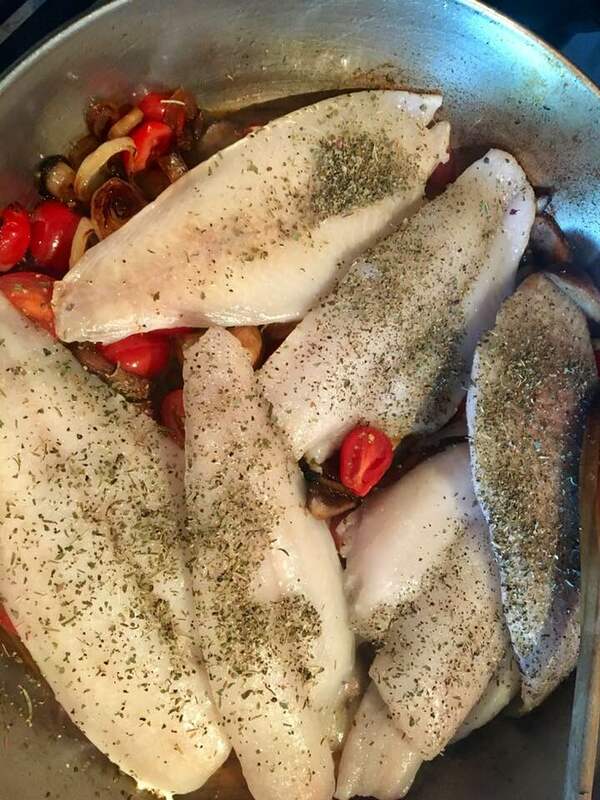 Flounder fillets poached atop onion, mushrooms, cherry tomatoes and white wine. Sprinkled with blue cheese and herbs de Provence. Goodness! Your easy recipes sound very fancy! Any fish can just be grilled with a spritz of oil and a sold salt or herbs of choosing, or shallow fried. When cooked until the middle has changed colour it is done and stunning and do quick. Don’t be scared of fish! Did I mention I’m also scared of grilling? Seriously, though, I know you’re right. Just something I have to get over. Thanks for reading. When I say grilling I mean putting it in the oven in a pan. Not over fire!